As you might already know, the Austrian part of my family meets up once a year in Styria for a few days of catching-up, eating good food and drinking Styria’s very drinkable white wine. Last year’s attempt with my youngest daughter wasn’t very successful and resulted with me having to be transported back home to Switzerland by medievac. 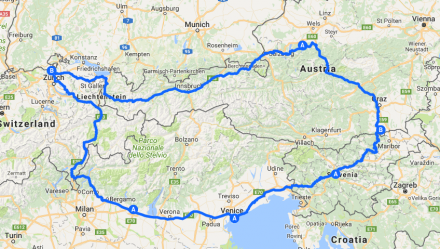 This year, my second daughter and I will re-attempt to make our way to Styria by TWIKE – Staying with friends in northern Italy and visiting Venice and Ljubljana before heading back into Styria. I’ll heading back home Sunday, staying in Gmunden with parts of my family for the night, before heading back to Zurich on monday. Updates on TDST2017 to follow soon.